A mother’s sari means many things to her child. This book will show you, through pictures of different textures and colours, the relationship between a child and a sari. Children see their mother’s saris in different ways. It is always a fascination to them and remembered by them as a cloth that has taken many forms. Some children use their mother’s sari to hide form things or people. It has always provided them with the comfort they needed. Sometimes, the sari is used as a swing or a beautiful train. This book contains a collection of images in the form of photographs and acrylics that show both the sari and children. Sandhya Rao is a Senior Editor at Tulika Publishers. She is considered to be one of the finest writers in India today and her books have won her many awards and accolades. 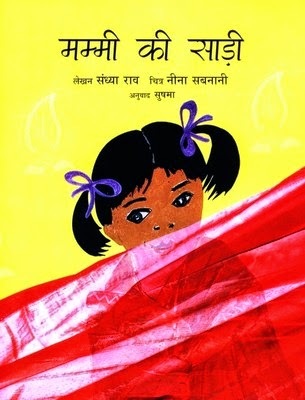 The United States Board for Books for Young People chose My Mother’s Sari, a book authored by her, as an Outstanding International Book for Books for Young People and the Children’s Book Counsel.